A.W.T. 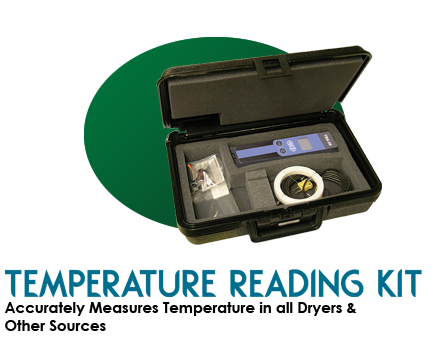 offers a high-quality, temperature reading kit to accurately measure dryer temperatures in your hot air, infrared, quartz, or UV dryer. This instrument allows you to make sure the temperature is uniform throughout your drying system. This information is essential to ensure that your inks are not under or over-cured and your substrates are not adversely affected. The heavy-duty model has a high-impact ABS plastic housing and waterproof seal. Each unit includes a probe with a 15-foot cable length to accommodate the heating section of your dryer. An optional probe with 40' cable is also available.